WASHINGTON -- Every three years, a diverse group of top scientists from around the world convenes at the International Conference of Gas Hydrates. The meetings, which have been taking place since 1993, provide a rare opportunity to explore developments surrounding the highly important ice-like substance. This year's conference is no different. Held in Beijing from July 28 through Aug. 1, it will focus specifically on how gas hydrate applications could lead to energy innovations and, on the flip side, to "climate change and geohazards." Considering the enormous potential gas hydrates hold for both (methane hydrates, for example, are a tantalizing energy source with a major climate risk), the national incentive to explore and understand the field is self-evident. Indeed, in conferences past, the Department of Energy has sent three representatives to the International Conference of Gas Hydrates. This year, however, they will only be sending one. "It happens to be me," said Dr. Brian Anderson, the director of strategic research in energy at West Virginia University. "So I'm very lucky." Budget cuts, Anderson said, have forced him to travel to Beijing alone. And while the opportunity may bode well for his personal career, it doesn't portend great things for America's role in gas hydrate research and technology. With only one person in attendance, the Department of Energy "is not able to demonstrate its leadership on an international stage," said Anderson. "For the entire department to be only represented by me, that's pretty sad." Anderson was in Washington, D.C., this week to receive the Presidential Early Career Awards for Scientists and Engineers (PECASE), the highest honor that the government bestows upon scientists and engineers in the early stages of their careers. Along with 101 others, he was recognized for his achievements by President Barack Obama and the heads of the government's top science agencies. 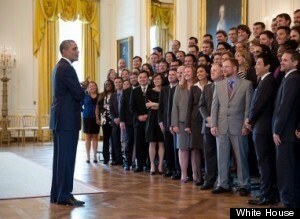 President Barack Obama talks with the Presidential Early Career Award for Scientists and Engineers (PECASE) recipients in the East Room of the White House, April 14, 2014. But if the week was supposed to laud the forthcoming generation of amazing scientific discovery, the mood around the group was more dour. At a Tuesday conference organized by the Science Coalition at the National Press Club, 10 of these best and brightest warned that science in America is under a significant strain. At the heart of their concerns were sequestration cuts and a budget that, even with some of those cuts fixed, is still stagnant. In 2013, the National Institutes of Health budget was reduced by $1.55 billion. Even after a budget deal at the end of the year restored some of those funds, the money was still $714 million short of the amount budgeted for 2013 before sequestration hit. It was also lower than where the funding stood during Obama's first year in office. Adjusted for inflation, the money allocated for 2014 was lower than every year but the first of the George W. Bush administration. The lack of available money, the PECASE recipients said, has created a hyper-competitive climate, in which a large group of very talented scientists are competing for a very small pool of grants. Dr. Andrew Goodman, an assistant professor of microbial pathogenesis at the Yale School of Medicine, said that it has become routine for researchers like himself to file grant applications in each of the three funding cycles for the NIH -- a pace of groveling that he "had never heard of until about a year ago." "The grants are not improving because it is more competitive. People are just writing more of them," he said. "The people who should be spending time mentoring students or working with colleagues are instead just spending time writing grants for every possible submission date there is." With more competition and fewer opportunities, the science and medical communities have watched a promising generation of young researchers leave their ranks -- disenchanted or lured to better opportunities elsewhere. Dr. Jonathan Pillow, an assistant professor in the Department of Psychology at the University of Texas at Austin, relayed how he had considered leaving the country for a research opportunity in Switzerland, where they gear funding around the scientist more so than around the project. The chance of leaving an "uncertain" U.S. funding climate was "appealing," he acknowledged, and several of his colleagues had already moved to Europe. Pillow ultimately stayed after ending up with a solid offer to study neurophysiology and human behavioral experiments at UoT. "For many years, the United States has benefited from a kind of reverse brain drain, which is that the best and brightest from all other countries would come to the United States to do research because we had for a very long time the most generous support for basic science," said Pillow. "But I have seen, especially recently, the trend is starting to reverse a little bit." Dr. Katherine Rauen, a professor in the Department of Pediatrics at the University of California, Davis, said that individuals struggling to obtain funding at her institution were leaving for the private sector. The dollars and stability there have always been more alluring, but the trend has become more pronounced, she said. And for a nation eager to shuttle as much brain power as possible into medical research, this trend is alarming. "We want them to stay in academic medicine," said Rauen. "We want them to stay in clinical, translational research to provide the best practices for patients in the future." Anderson said he had a colleague who recently took a faculty position in Europe -- where he "has access to a much more favorable funding environment" -- in order to pursue work on an energy technology that most experts believe is 30 years from being viable. If it seems like a risky gamble for that foreign government to take, Anderson noted that the technology being used today in the shale gas boom was developed 30 years ago with federal funding. "That’s the role of federal research funding, is to be able to look forward 30 years," he said. Goodman, meanwhile, spoke of the "brain drain" in more stark and concrete terms than others. Rather than watching colleagues leave for greener pastures abroad, he said, he's been watching them leave the field entirely. "The people whose work has not been funded, they sort of disappear," he said. "Their website is gone. They don’t come to the meetings, and that's the last I hear about it." For 45 minutes or so, a cloud of seeming desperation hung over the discussion, with the PECASE recipients -- seated along tables arranged in a square formation -- sharing thoughts, theories and stories. And then, something peculiar happened. Each of the 10 participants was asked to predict where scientific funding in America would be in 20 years on a scale of 1-10; one being absolutely dire and ten being completely rosy. The pessimism suddenly vanished. "Ten." "Eight." "Eight." "Five." "Seven-to-eight." "At a five now but could be a 10." "Nine." "Nine-to-10." "Now five but hopefully 10." "We have the tools and the talent for a 10." "7.5." Was there any good reason to feel optimistic beyond, perhaps, having just been feted and praised by some of the top administration officials and the president himself? Maybe so. Two weeks ago, there was a rare legislative breakthrough to authorize $120 million for pediatric research at the NIH over the next decade. And last week, a bipartisan group of House members (25 Republicans in total) wrote congressional appropriators requesting that money for the NIH be set at a minimum of $32 billion for the 2015 fiscal year. It currently stands at $29.934 billion. "We feel this amount is the minimum level of funding needed to reflect the rising costs associated with biomedical research," the letter reads. "At a time of unprecedented scientific opportunity, it is critical that the United States make forward-thinking investments that promote medical breakthroughs as well as our international leadership in biomedical research." CORRECTION: A previous version of this article omitted the word "million" when talking about the 2013 NIH funding shortfall.